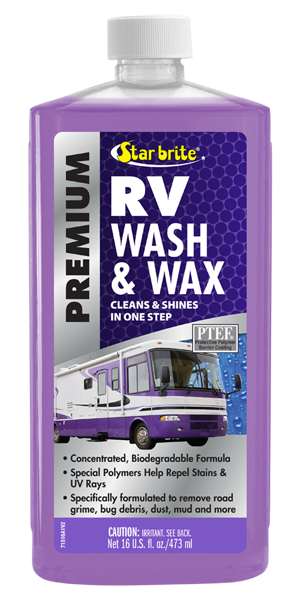 Star brite® Premium RV Wash & Wax is specifically formulated to clean and shine in one step, saving time and money. It removes road grime, grease, bug deposits, dust and mud from all exterior areas of an RV while adding a deep shine. Contains UV inhibitors to help protect against fading. Unlike dishwashing detergents that can strip polish or wax, Star brite® Premium RV Wash & Wax has the power to loosen and remove tough dirt without removing protective coatings. Star brite® Premium RV Wash & Wax extends the life of the wax or polish on your RV. DIRECTIONS: For best results, use when surface to be cleaned is cool to the touch. Add about an ounce of Star brite® Premium RV Wash & Wax to a bucket of water, mixing well. Apply using a cloth, soft brush or sponge, then rinse well. Use a towel, chamois or blower to dry the washed area and reveal the shine. To keep your RV looking its best, apply a protective coating of Star brite® Premium RV Polish with PTEF® at the beginning of each season. Use Star brite® Premium RV Guard Speed Detailer & Protectant with PTEF® after each washing or as often as needed to enhance the shine and extend the life of the polish, or to spot clean light road grime, bug deposits or bird droppings.